ali.a.r wrote: Reminds me of the Czech Dana artillery in Wargame: European Escalation. Any chance this was inspired by such a system? Aah. Thanks for the clarification. This vehicle is wheeled, not because the DANA or the South African G6 (both very good vehicles BTW) are wheeled, but because all the other vehicles it will be operating with will be wheeled. So this gun itself is standard for everyone, its just the chassis they are built on thats different? BTW, the reason I brought up the DANA was that it kinda looks like it. Or maybe Im just too obsessed with it. Nothing wrong with being obsessed with the Dana... it is an excellent vehicle/system. The South African G6 is even better in the fact that it has been made mine resistant and has excellent range. 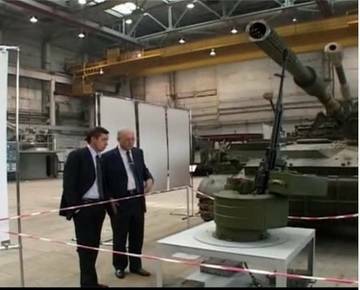 This new Russian artillery system however is going to be their standard turret, which by the way is completely unmanned and fully automatic, for a range of suitable platforms. In the heavy tracked version (armata chassis) all the crew sit in the hull just like in the MBT version. This suggests to me a standard turret... even the naval model should be able to be fitted to a vessel fairly easily though I would expect far more sophisticated stabilisation systems as the naval model needs to fire while moving,... will be fitted to a range of platforms and for certain locations would be ideal as a fixed system like the do with tank turrets for coastal defence. I don't think there will be a light wheeled version and the medium wheeled version is clearly going to be truck based rather than crammed into a Boomerang chassis because of the reasons given in the article. Think of it along the lines of the air defence vehicles... the Pantsir-S1 in the heavy brigades will simply be a Pantsir-S1 turret mounted on an armata chassis, and the Boomerang and Kurganets chassis likely will also take a similar turret... perhaps with extra gun ammo in the rear hull compartments. The light Typhoon model might have one gun and perhaps a reduced number of missiles or it might have a different turret with different missiles like SOSNA-R to reduce weight yet retain range exceeding that of MANPADS. 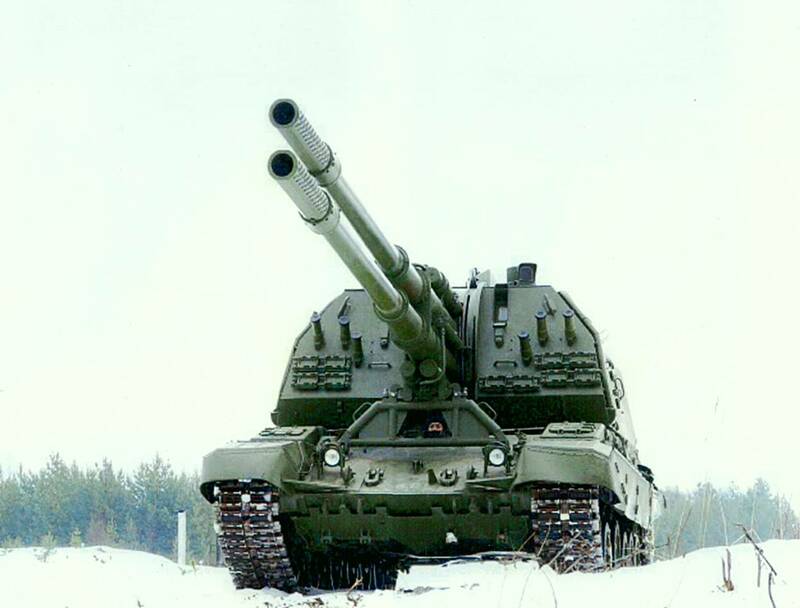 The current gun artillery system is MSTA, which is based on the T-80 chassis, so it can have similar mobility to the tanks it operates with. 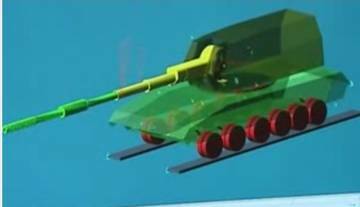 The logical extension of that would be if there were BMP and BTR brigades that a BMP and BTR based model would make sense to give it the mobility to keep up with the vehicles it is operating with. 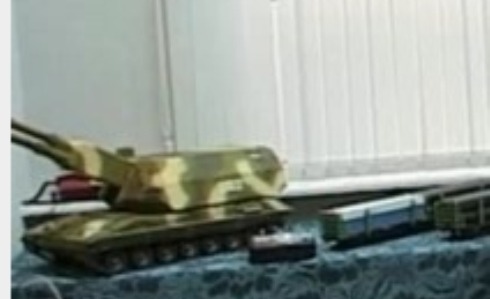 The problem is that both the BTR and BMP would be too light to carry such a powerful weapon so they have substituted the wheeled version with a truck based version. 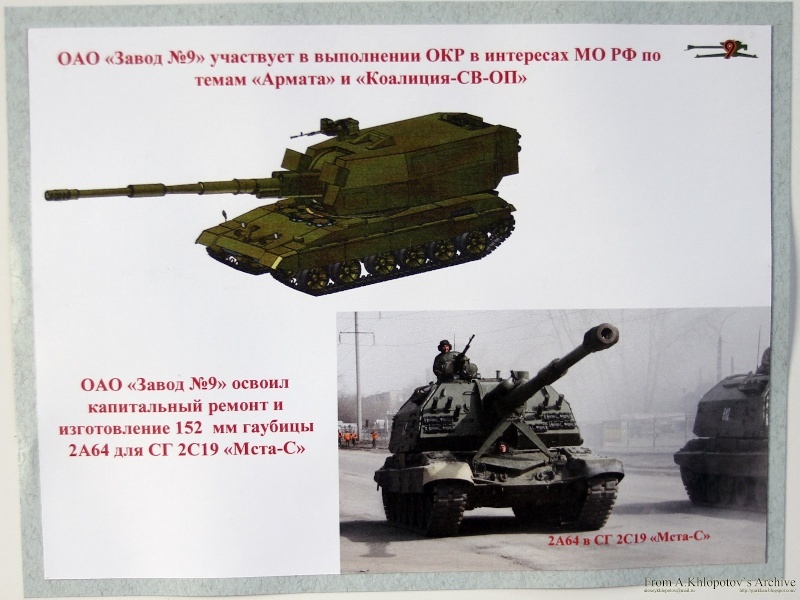 To operate with the BMPs they would likely use a T-80 based model and accept the different engine and components, but starting from scratch they will likely develop the much heavier Kurganets chassis to allow it to use the bigger gun in an artillery vehicle. 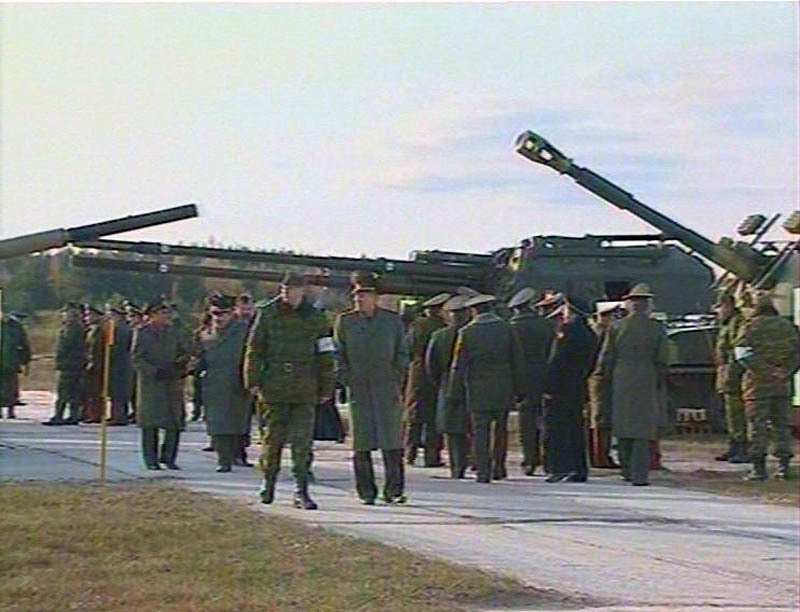 I think Russians were impressed by French Caesar SPH and its strategic transportability. They are lighter than tracked ones and with that better for quick reaction forces and to airlift them on longer distance in shorter time. Garry mentioned G6.. Just seen the video about it. Fire rate is enormous! What is fire rate of MSTA? Rate of fire is currently pegged at 6-8 rounds per minute. The Kord RWS on the turret looks compact. I wonder if that will be the standard 12.7mm arrangement. Is this a single gun version of the koalitsia? BTW will the armata chassis be able to reach 60-70 km/h offroad like the Leclerc and leopard 2A6 or will it stay the pretty pathetic T-90 speed offroad speed level? Also if the gun launched ATGM had fire and forget capability I think that would be a massive improvement. "BTW will the armata chassis be able to reach 60-70 km/h offroad like the Leclerc and leopard 2A6 or will it stay the pretty pathetic T-90 speed offroad speed level?" Came across this, and what appears to be a mock-up of the Koalitsiya on what appears to be a very long chassis, 8 road wheels! Seems fine as it isn't front line though...but does anyone know whether it was shown in the RAE 2013? This one? I think it has 7 road wheels. It's not 195's hull, the profile of the glacis is wrong. It doesn't really look like KBTM's hull proposal either. Is the twin barreled Koalitsya project still alive? TheArmenian wrote: Is the twin barreled Koalitsya project still alive? Not sure. The naval version would make sense as weight isn't a requirement. The Army may keep it, but I think a single barrel version is more likely. That's just my opinion though. The only reason for the reduction to one gun is to fit in cargo planes. By removing one barrel you also remove the dual feed autoloading system associated with that barrel which should make it rather smaller and lighter. Such concerns are not relevant to the naval models and indeed the fixed position models or models adapted to coastal defence. 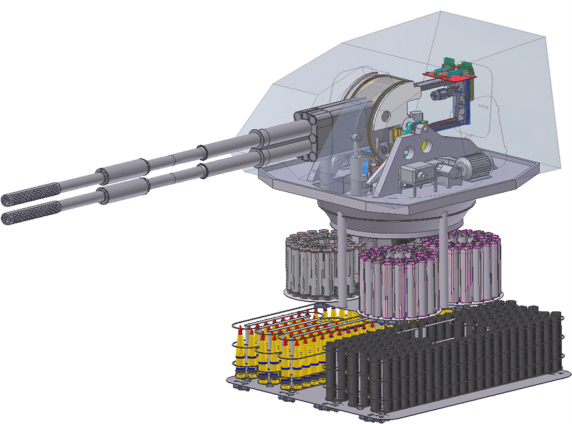 That would make sense... it needs to be remotely operated as the turret is unmanned so the chance of someone opening the hatch and loading more ammo is zero, so it needs all its ammo ready to fire, plus some way of clearing jams, in addition to sighting and aiming. Those things related to these things? Those are early Koalition mock ups, but yes part of the research program. Though it sounds like for land use they are going with single barrel. From this recent post, appears like the 2s35 might have an attached reloading vehicle, like the Swedish bv series? The first link shows only a basic drawing of a support vehicle that looks rather like the support vehicle for the US M109 howitzer... as it is not in the diagram below that shows the vehicle in context of other support vehicles I suspect it is pure speculation. I have seen trucks with ammo on board that will most likely be used when sustained fire operations are needed. Regarding the chassis for the towed model test I suspect that old WWII 203 mount was probably available for a quick test. For short range mobility it would be a very useful base offering excellent short range mobility (they had their own motors and could be driven short distances without vehicle support when needed). Well, I meant the 2nd pair of threads though, and in the link one can see what appears to be a gun mantlet rather the a gun shield, as seen from its curvature..so perhaps trying to test the recoil and elevation? One of the features of the new guns will be rapidly firing shells with different propellent loads at different angles so that they all arrive on target at once... maximising their effect. From an artillery point of view the faster you can get your shells on target the better because in about 10-15 seconds from the first impact most of the enemy forces will have dived for cover and will be much more difficult to kill or injure. This means that if you can get 8 rounds to impact the target almost at once from one gun vehicle then a battery can fire and then be on the move... all the shells will arrive almost at once maximising their effect on target but the firing unit will be on the move before any counter battery fire can be directed at them. 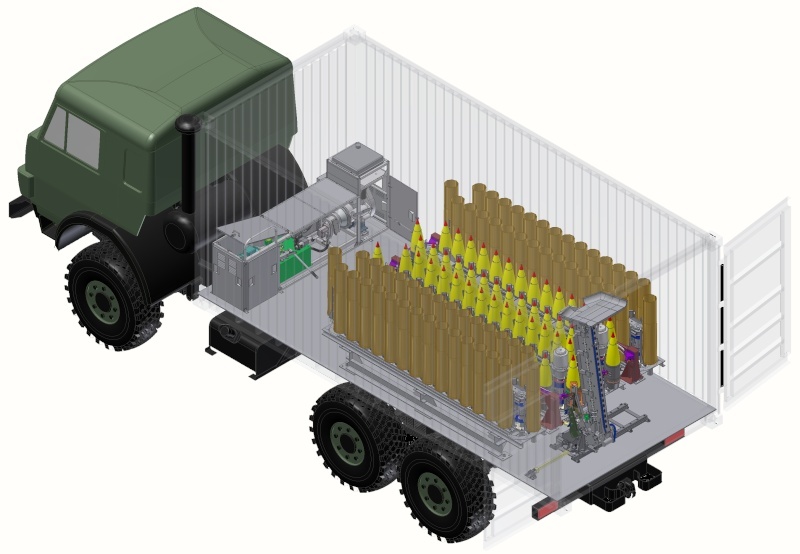 The reloading vehicle would most likely be waiting at the position they intend to move to to have a quick reload before firing and quickly moving off again. - Fundamentally - uninhabited BO, automatic loading, automatic guidance. - Some compare the "coalition" with the U.S. "Crusader", in fact, they are very similar? Many similarities in the concept? - The concept is similar, the implementation is different. We have done some things differently and more efficiently. - At the time of writing we develop missiles with guidance on GLONASS, do you think, will find their place if such weapons in our artillery? - Required. We practiced (tested) different types of weapons, systems of correction and guidance. 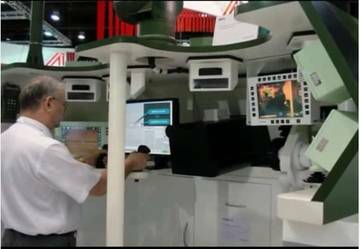 Including - autonomous satellite-guided correction module, mounted on the head instead of conventional munitions fuze combined unit plus satellite radioballistichesky, ammunition homing fingerprinting goals, etc. - How important in modern conditions the firing range? - Range of fire - not an end in itself. It is important to have a range of real fire, sufficient to solve problems in all types of combat. Artillery brigade-level - it is 25-30 km. That is, given the removal of firing positions from the front edge, SAU should shoot for 40-45 km. Coalition on the Armata chassis. 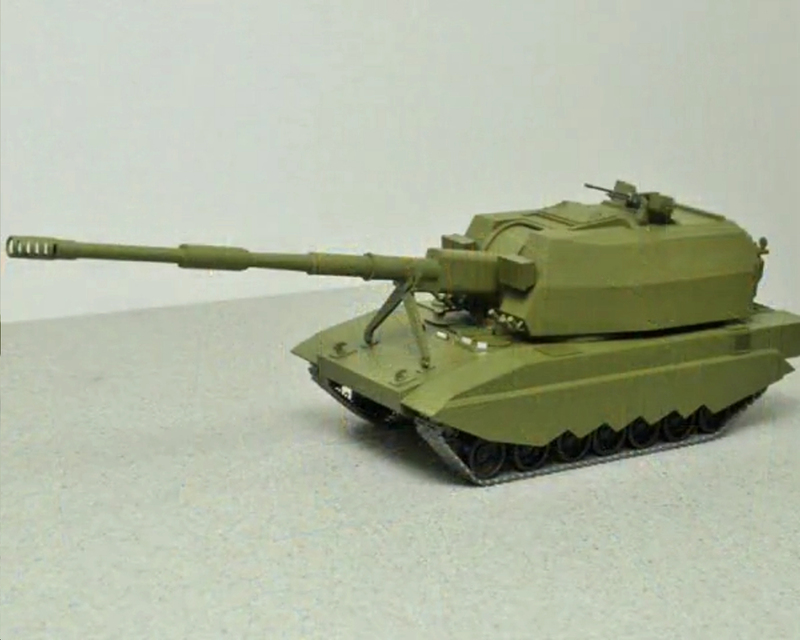 Gur Khan claims it will be on T-90 chassis. Guess we will see soon. I really want to see more detail of that Kamaz reloading truck.